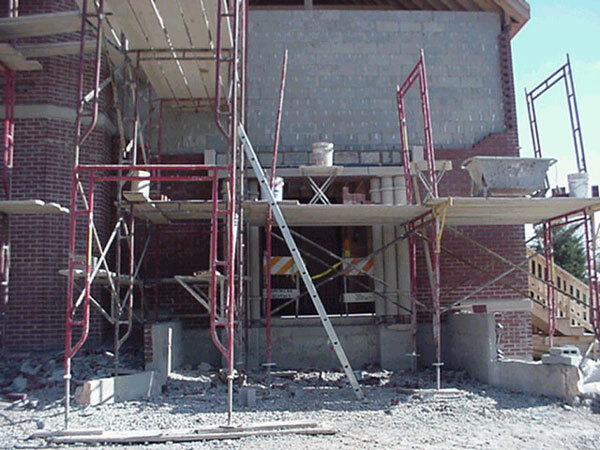 Here are some exterior views of the continuing construction. Things are really coming along. 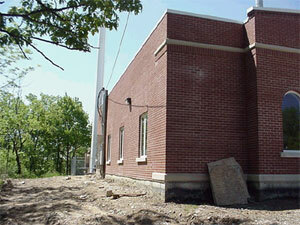 The brick work nears completion. 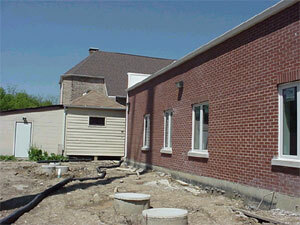 Window are installed along with exterior doors and lighting. 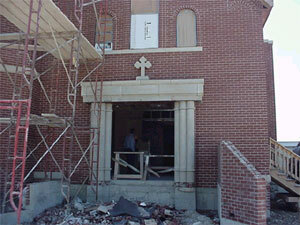 Above we can see the development of the front of the building and the brickwork including the cross above the new front entrance. Above we can see the bell tower rising into the sky. 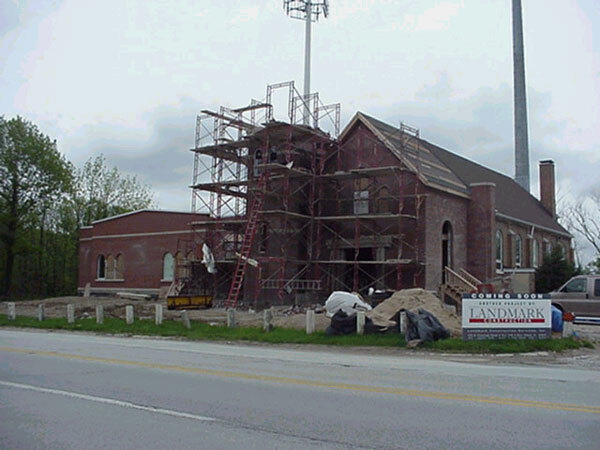 If you look closely you can see the brick columns on top that will support the dome that will house the bells. 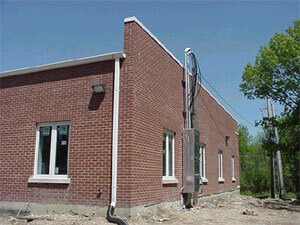 Also we can we the view of the east wall of the building with windows and exterior lighting. 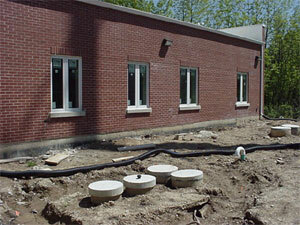 Below we can see the rear of the building and the septic field. 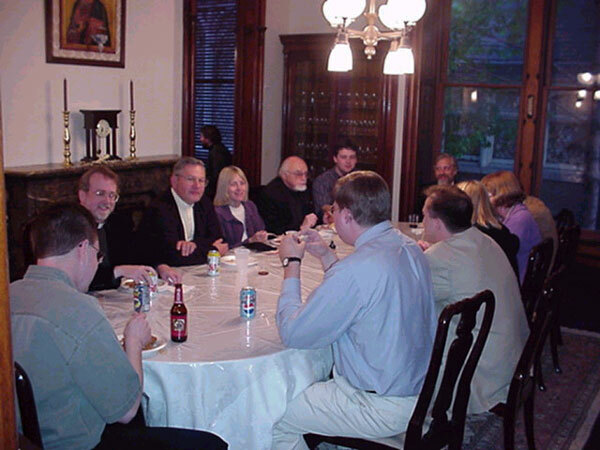 Each year on Bright Friday Bishop Job invites the clergy and wives of the Chicago Deanery to his residence on La Salle St. in Chicago for an evening of fellowship and sharing of Paschal foods. Everyone enjoyed this festal celebration with Bishop Job as our host. Christ is Risen! 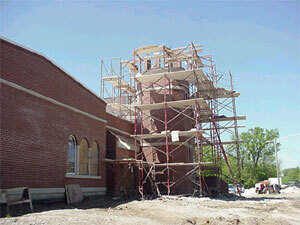 Construction continues with the front entrance and the bell tower. 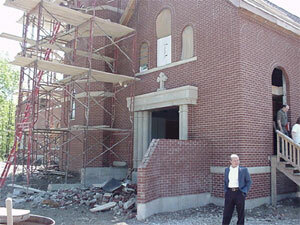 Ron Stacoviak has supported the Hines Hospital Orthodox Veterans ministry for 15 years. He is a member of Holy Trinity Cathedral in Chicago. 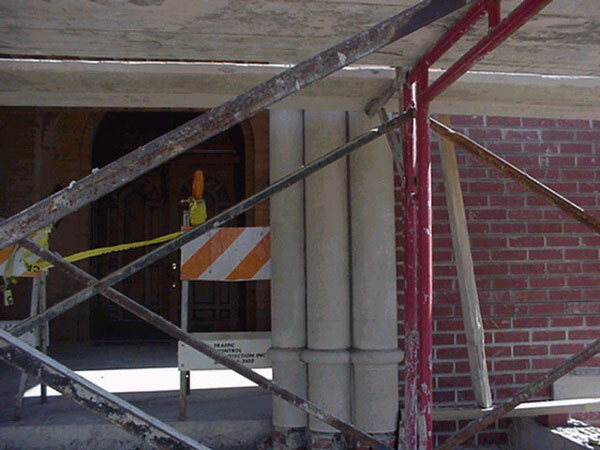 It was he who asked Father Andrew who had been an Orthodox, VA Chaplain in California to visit Orthodox patients. Father Andrew petitioned his beatitude Metropolitan Theodosius and was assigned as Orthodox Chaplain to Hines Hospital at the beginning of this year. Ron Stacoviak checks on new patients and informs Father Andrew as to there condition and needs. Father Andrew makes monthly visits and is called in when there is an emergency. At Christmas and Pascha, Ron Stacoviak prepares and schedules the chapel for Father Andrew to celebrate the Divine Liturgy. Members of St.Luke and other parishes attend and sing the responses. The service is televised through out the hospital. 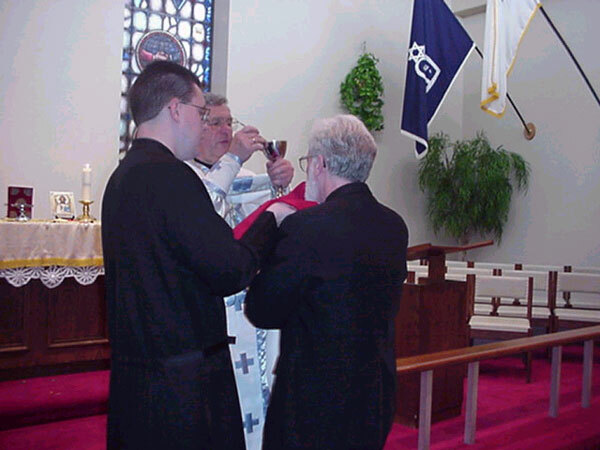 The photo shows Father Andrew giving communion to one of the participants. 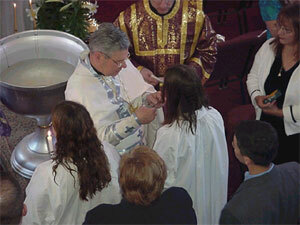 When the Liturgy is over Father Andrew take communion to patients who could not attend. 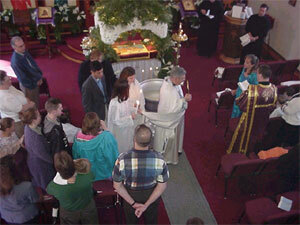 On Holy Saturday, May 4th we had the privilege of participating in the ancient rite of Holy Baptism. 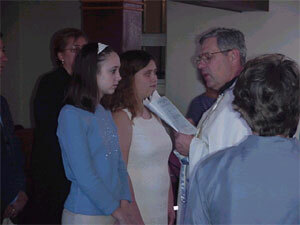 The two catechumens Lydia Vetter and Victoria Murphy, who had been receiving instructions in the Orthodox faith, were baptized. 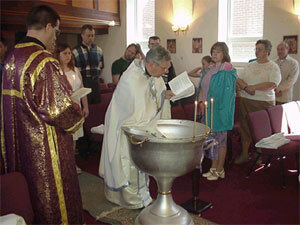 Historically Holy Saturday has always been the most celebrated day for baptisms. This was the culmination of the 40 days of Lent which was specially organized for the preparation of catechumens who were baptized on this day. 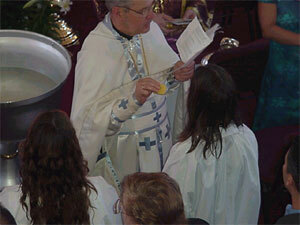 Those already baptized followed the 40 days of Lent to show their solidarity with the catechumens. The eight photos show the process from the statement of faith the Nicean Creed, the baptism where their heads were drenched with water, the giving of the Holy Spirit in Chrismation, the presentation of their baptismal robes, the holy procession around the font and the reception of Holy Communion. 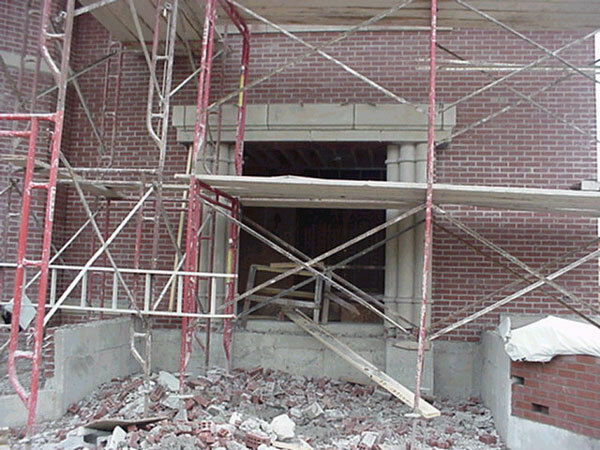 As the brickwork reaches it's final stages, custom shaped columns are being set.